Price predictions are common in the crypto space, partly because many investors rely on them for motivation and partly because some of them come to pass. Even so, many Bitcoin predictions turn out on the wrong side. Here is a list of Bitcoin price predictions that failed to meet their targets for 2018. As early as March 2018, financial analyst Ronnie Moas predicted that Bitcoin would experience a bullish trend and hit $28,000 in value, most likely by mid this year. However, as things stand right now, this Bitcoin prediction may not see the light of day. The year is almost ending, but the world’s biggest and pioneer cryptocurrency is nowhere near half of that figure. As of this writing, Bitcoin is valued at $3,965 USD on CoinMarketCap, a website that lists cryptocurrencies in terms of their market size. Several things will need to change before this situation could change for the better. Since it hit its all-time high in early 2018, Bitcoin’s price has gone through a series of downfalls as the bears continue to bring down the price uncontrollably. Volatility is part of the crypto market, but the chances are scanty that BTC will bounce stronger in the remaining days of the year. 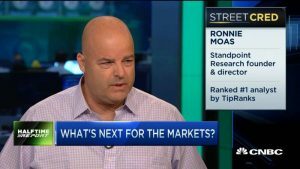 Ronnie Moas is a Wall Street analyst and Founder of Standpoint Research. His Bitcoin forecast was somehow not focused on the current performance of cryptocurrency. Perhaps he envisioned an upward trend to emerge quite soon, even as technical analysts display significant sell signals. In December 2016, Kay Van-Petersen predicted that the Bitcoin price would hit $2000 in 2017. At that time, Bitcoin was valued at $900 on Coinbase. This prediction came correct when, by May 2017, the value of the cryptocurrency had already surpassed $2000. However, another Bitcoin prediction by the same analyst is headed in the wrong direction. Van-Petersen mentioned that the Bitcoin price could hit $100,000 in 2018. Based on the current price of bitcoin, this prediction might not come true. Since January 2018, the coin has experienced a tremendous drop in value that could take long to recover. Van-Petersen’s bitcoin forecast of $100,000 even contradicted his earlier statement that it could take ten years for the value of bitcoin to hit that mark. Towards December 2017, bitcoin maintained a bullish trend that left many experts concluding that the cryptocurrency could hit $60,000 in 2018. However, the value of the pioneer cryptocurrency is nowhere near this figure as the year draws closer to its end. While bitcoin remains resilient and dominant of the crypto space, its value has dropped tremendously since January 2018. Speaking about BTC early this year, a couple of experts believed that the value of the cryptocurrency was hovering between $50,000 and $60,000. Mike Novogratz is a renowned analyst and hedge fund investor. According to him, Bitcoin’s price could hit $40,000 in 2018. Considering how the value of the cryptocurrency hit half of that figure at one time, Novogratz’s bitcoin price speculation could still happen, but not in 2018. As of this writing, the price is slightly above $3000 USD. Most people would be happy if it stays there or goes up, but not below the three thousand dollar-mark by the end of December. Based on the performance of Bitcoin and other altcoins in general, it’s safe to say that the year has not been favorable for cryptocurrencies. Even the basic altcoins such as Ethereum, Bitcoin Cash, and others have had their values slashed by huge margins. With the little life left for 2018, we can only wait to see how things are going to be in the crypto space. Thomas Lee’s bitcoin forecast of $14,000 is one of those that will miss the mark as far as bitcoin’s prediction in 2018 is concerned. The Wall Street bitcoin bull mentioned a few factors that he thought could propel bitcoin’s price to that mark. The factors included a growing list of active wallet addresses, an increase in transactions per account, and “factors influencing supply.” However, this is not coming to fruition any time soon, with only a few days left in 2018. Thomas Lee is a prominent bitcoin investor and co-founder of Fundstrat Global, a research company. While he used strong statistics and data science to support his predictions, none of them is close to what the charts are displaying. In one of his tweets, Lee predicted that bitcoin’s price could reach $25,000 in 2018. Many bitcoin price predictions are likely to miss their targets for 2018. However, this does not mean speculations are invalid. From the failed forecasts, there are valuable lessons to learn. The crypto space is one laden with high volatility and, therefore, no one can tell exactly what will happen in the next hour, day, week, month, or year. While 2018 has been mostly bearish, seasoned investors and crypto influencers such as Erik Voorhees, John McAfee, Tim Draper, and many others are quite optimistic that cryptocurrency is the way to go. As 2018 ends, analysts can express their opinions, but the public can only trust the charts.